While most people who havesaltwater aquariums keep tropical-fish-only or reef tanks, a few aquarists have undertaken the challenge of keeping subtropical, temperate or cold-water aquariums. One of the most challenging aspects of keeping one of these tanks is sourcing fishes and other animals for the aquarium. While they may be more challenging to acquire than many tropical saltwater fishes, many excellent options exist for a cold saltwater tank. Catalina gobies (Lythrypnus dalli), zebra catalina gobies (Lythrypnus zebra) and garibaldi (Hypsypops rubicunda) are three of the most common temperate water fishes available to the aquarist. Several species of temperate water rays, such as Urobatis halleri, are available from time to time at specialty retailers, as are some cold-water wrasses and tusks such as Pteragogus aurigarius and Choerodon azurio. Several temperate water seahorses from genus Hippocampus are occasionally available. Fully research these animals before acquiring them, as some get too big for all but the largest aquariums. Aquarists who live in subtropical and temperate zones often collect their own species for their temperate tanks. 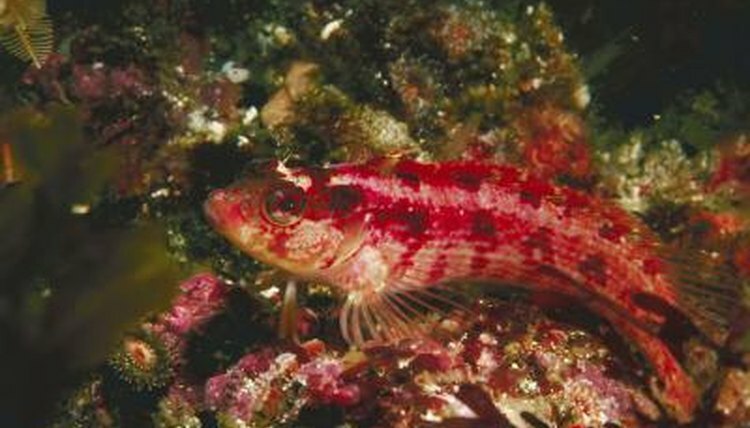 Various sculpins, sticklebacks, rockfish and greenlings are relatively easy to collect and generally quite plentiful in tide pool and near-shore habitats. For the somewhat more ambitious collector, a variety of temperate water filefish and pipefish, as well as gunnels and eels, can make good aquarium fishes, so long as you're prepared to meet their husbandry needs over the long term. Before collecting your own aquarium animals, check all local laws and adhere to fishery regulations at all times. While it's called a fish tank for good reason, most temperate water aquarists keep other temperate water animals with their fishes. A wide array of anemones, corals, crustaceans, tunicates, jellyfishes, mollusks, sea stars and other endoderms are available. The diversity, colors and behaviors of many of these animals have lead some temperate water marine aquarists to keep reef-only tanks with no fishes at all. Again, if you're collecting your own animals, be sure to check local laws and abide by all regulations. Because relatively few people keep temperate marine aquaria, it can be difficult to thoroughly research a temperate water species before acquiring it. Several free online databases provide useful information regarding most species. An increasing number of forums also now have sections dedicated to temperate water aquaria, and a few forums focus only on temperate water tanks. One well-respected company, Oregon-based Coldwater Marine Aquatics, offers only temperate water species for sale, shipping animals anywhere in the country and providing excellent advice on care. Ret Talbot is an award-winning writer and photographer, as well as a lifelong freshwater and marine aquarist. He is the author of "Banggai Cardinalfish; A Guide to Captive Care, Breeding & Natural History" and "The Complete Idiot's Guide to Saltwater Aquariums." He is also a senior editor at "CORAL Magazine," the world's leading reef and marine aquarium magazine. Do I Need a Filter if I'm Going to Have a Protein Skimmer?